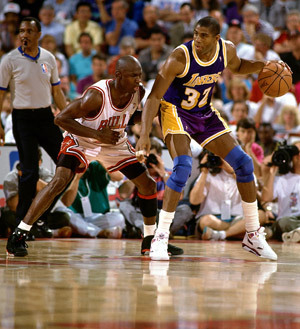 Would You Take Jordan’s 6-0 record in the NBA Finals or Magic Johnson’s Nine NBA Finals Appearances? While listening to The Dan Patrick Show two days ago, an interesting question arose. Would you rather appear in six NBA Finals like former Chicago Bull Michael Jordan and go undefeated or win five NBA championships in nine tries as was done by Los Angeles Laker legend Magic Johnson? When first questioned, you may six you would prefer the six NBA championships won by Jordan. Before answering, let’s take a closer look at the championship appearances by Jordan and Johnson. There is no doubt Jordan was the best player of his era and, arguably, of all time. He was an explosive scorer, strong defender, and may have had the strongest competitive fire of any athlete of all time. Not only did Jordan go 6-0 in NBA Finals in his career, but he also was voted the MVP of the NBA finals all six years. Jordan was finally able to capture his first NBA championship during the 1990-1991 season as the Bulls defeated the injury-riddled Lakers 4-1. While Johnson did his best to carry the Lakers, injuries to James Worthy and Byron Scott were just too much to overcome going against Jordan, Scottie Pippen, Horace Grant, Bill Cartwright, and John Paxson. The Bulls won another championship at the end of the 1991-1992 season defeating the Portland Trail Blazers who were led by Clyde Drexler, Jerome Kersey, and Terry Porter. Jordan and his teammates won this series 4-2. A three-peat occurred at the end of the 1992-1993 season as the Bulls faced a strong Phoenix Suns team led by Charles Barkley, Dan Majerle, Kevin Johnson, Tom Chambers, and Cedric Ceballos. Air Jordan and company took the series 4-2. After a brief retirement by Jordan and attempt to play professional baseball, the Bulls struggled for the next few seasons. Finally, the Bulls returned to the finals at the end of the 1995-1996 season where they faced Gary Payton, Hersey Hawkins, Detlef Schrempf, Ervin Johnson, Sam Perkins, and the Rain Man, Shawn Kemp. Jordan won his fourth NBA championship as he and his teammates defeated Seattle 4-2. The Bulls defeated the Utah Jazz the next two seasons 4-2 to win their second three-peat of the Jordan era. Utah’s core players of Karl Malone, John Stockton, Jeff Hornacek, and Byron Russell could not figure out a way to end the Bulls’ reign. Jordan retired at the end of the 1997-1998 season only to make a brief comeback with the Washington Wizards from 2001-2003 that showed Jordan was no longer the dominant player he once was in Chicago. Take away those three seasons in Washington and Jordan appeared in and won six finals in 12 NBA seasons. Johnson played 13 seasons in the NBA including a comeback during the 1996 season five years after his last NBA season. Take that season away, and Johnson appeared in a remarkable nine NBA finals in 12 seasons including eight finals in his first ten seasons. Throughout his career, Johnson went 2-1 against the Philadelphia 76ers led by Moses Malone, Julius Erving, Andrew Toney, and Mo Cheeks. Johnson’s Laker teams also went 2-1 against the great Celtics teams of the 1980’s led by Larry Bird, Danny Ainge, Robert Parrish, Kevin McHale, and Dennis Johnson. Another strong opponent the Lakers faced in the finals were the “Bad Boys” from Detroit led by Isaiah Thomas, Bill Laimbeer, Joe Dumars, Vinnie Johnson, John Salley, Dennis Rodman, Adrian Dantley, and Rick Mahorn. The Pistons were loaded and lost to the Lakers in the finals at the end of the 1987-1988 season, but came back and defeated the Lakers for the NBA title. Jordan and Johnson were both amazing players who had exceptional careers. In his early years, Jordan really struggled to get his team to the next level. Once they surrounded him with talent, they did much better, but still took a few years to get past the Detroit Pistons. Jordan finished his Bulls’ career strong winning six titles in his last eight seasons in the Windy City. Yet, I probably would take Johnson’s nine appearances in the finals and five titles over Jordan’s 6 for 6. The league was filled with so many strong teams back then that appearing in the finals essentially nine out of 12 seasons is truly amazing to me. It is true those Laker teams were talented, but Magic was the leader who stirred the drink and made Showtime a household name in the eighties.